If you see the flea beetle that's highlighted in this Alert, would you please contact me? Just click on my name at the top of this report to get my e-mail address. 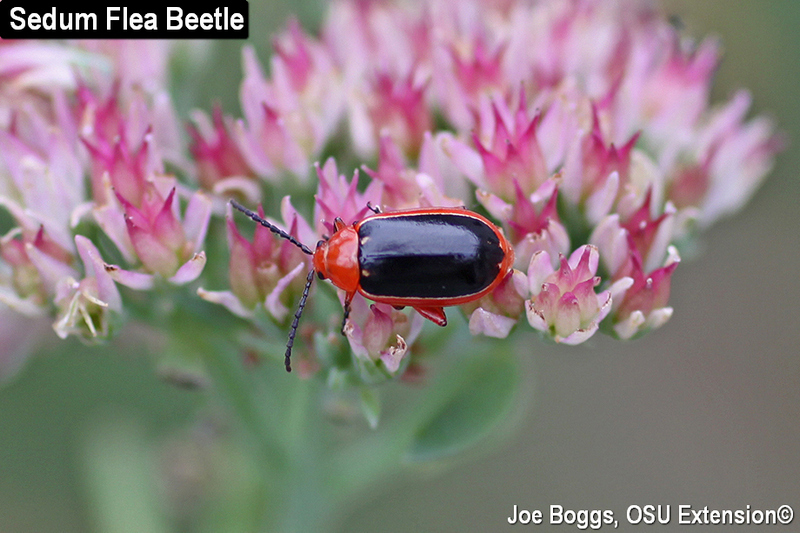 In early October, 2011, I received a phone call from a homeowner in eastern Cincinnati who said brightly colored beetles were destroying her Sedum x 'Autumn Joy' (family Crassulaceae). I visited and found a flea beetle that I'd never seen before was doing so much damage it was hard to identify the plants. For you purists, I do recognize that Sedum x 'Autumn Joy' is now Hylotelephium telephium ‘Autumn Joy’. I learned a flea beetle could take the joy out of autumn, and then I learned taxonomists took the autumn joy out of Sedum. But I digress. I could not identify the flea beetle culprit. The best that I could do was to find a very similar looking flea beetle, the passionflower flea beetle (Disonycha discoidea, family Chrysomelidae). You can see some good pictures of this beetle posted on BugGuide by clicking on "More Information" below. One of the best resources for linking leaf beetles to their plant hosts is Clark et al. 2004. Host plants of leaf beetle species occurring in the United States and Canada [see "More Information" below]. The authors note that the passionflower flea beetle only feeds on passionflowers (family Passifloraceae): Passiflora incarnata and P. lutea. Neither Sedum nor Hylotelephium are listed as hosts for any of the 31 flea beetle species in the Disonycha genus. I failed to collect adult specimens to send to a taxonomic specialists and I never saw the flea beetle again … until yesterday. BYGL reader and avid gardener, Sterling Abernathy of Kettering, OH, e-mailed me on Saturday asking about an insect destroying his 'Autumn Joy', and he included pictures. Voila! Sterling was gracious in allowing me to visit his beautiful landscape to take pictures and collect beetle specimens. I found both adults and larvae. This observation coupled with finding only adults in October, 2011, means this flea beetle probably has at least two generations in Ohio. Sterling's landscape is highly diverse offering multiple hosts. However, the beetles were only feeding on 'Autumn Joy' as well as 'Munstead Red.' This further solidifies my belief this beetle has a narrow host range. However, I await your observations. I'm now in the process of tracking down a taxonomic specialist who can hopefully track down the born identify of the flea beetle. In the meantime, I'm calling them "Sedum Flea Beetles," plant taxonomy notwithstanding.